Had I been in slow motion, I’m fairly certain the dance I was doing could’ve been construed as graceful–my leaping described as Balanchine-esque, my hand swooshing through the air considered elegant. Alas, I was dancing in real time, not before an audience but alone, in my apartment, beneath my smoke detector. I was wildly attempting to disperse the gray haze billowing out of a bag of what was once popcorn, now just smoldering carbon. My limbs flailing and my kitchen towel flapping, I was neither Balanchine-esque nor elegant, and I was definitely not graceful. The microwave door stood ajar in mocking triumph. Again. It’s hard not to get a little melodramatic when I repeatedly botch the simple–maybe even moronic–task of microwaving popcorn. It goes something like this: I stand just inches from the microwave, close enough to be at grave risk of inviting cancer at worst or a Ninja Turtles superpower at best. I keep my index finger poised and twitching near the STOP button as I dutifully count the seconds between mini-explosions, yet I inevitably reach one of two disparate and disappointing results. Either I panic and punch the button too early, only to watch the bag deflate along with my ego. Or I wait a little too long, prematurely congratulating myself at the sight of the puffed bag, only to be rewarded the moment I rip it open by the acrid stench of failure–and, of course, the opportunity to engage in my crazy towel-flapping jig. After years of blackened kernels, I resorted to old-fashioned common sense, which in this instance equates to old-fashioned stovetop popping. That’s when the Wabash Valley Farm Whirley Pop entered my life. The 6-quart pot with benefits is made of thinner metal than most pans, so it heats up fast–so fast it can pop a pot of corn in the same amount of time as my darn microwave. Its vented lid allows steam to escape, ensuring the popped corn stays crisp without my having to struggle to keep a wobbly lid slightly ajar. And then there’s the apparatus’s most distinguished fixture, a turn-crank apparatus attached to the underside of the lid. 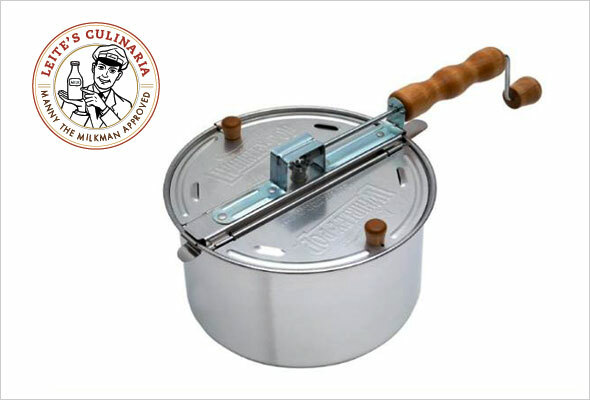 I just rest one hand on a central wooden knob and with the other I turn the crank handle, which “whirls” a stainless steel arm around the bottom of the pot, keeping everything in constant motion and thereby minimizing old maids, elevating popped corn safely away from the scorching hot pot, and yielding unparalleled results. Best yet, since the Whirley Pop is dedicated to one thing and one thing alone, I just wipe it with a paper towel when I’m done–no need to scrub it squeaky clean (or dance and flap). While the contraption’s hardly new, it was new to me, and, as such, was a revelation. I may have to work at it by standing and cranking, but it’s a small price to pay. Besides, with my mind liberated from the one-two count required by my old nemesis, I have time to do other things. Like smirk at my unused microwave. The Wabash Valley Farm Whirley Pop comes complete with directions, recipes, and a 25-year warranty on all the Whirley Pop’s moving parts, all for just $20–a bargain when you think of how many bags of pricey microwave popcorn you’d otherwise waste. Available at Amazon.com. Saving room for dessert since birth, Jenna Rose Levy has always had an abnormal appreciation for food. After she worked at a Connecticut farm and for bakeries on the East Coast and West, there was no turning back. 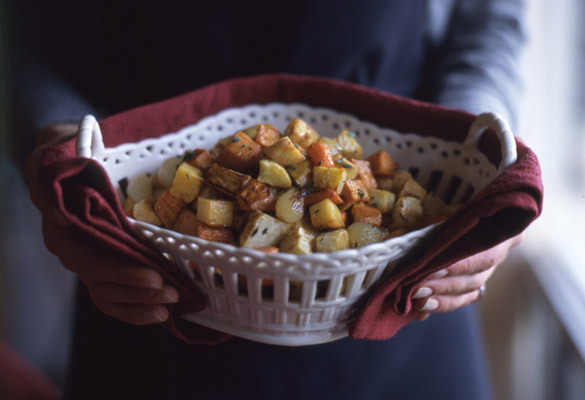 Jenna earned her Master's degree in Food Studies from New York University, and she brings all her knowledge to work each day at Leite's Culinaria and, on the side, to her food blog, Sweet Hearth. On the rare occasion that she isn't doing something food-related, she can be found perfecting her Bananagrams game, planning her next globe-trotting adventure, or exploring the back roads of Boston as she trains for her first marathon. I never had microwave popcorn growing up – my mom *always* used a Whirley Pop. It makes such good popcorn, and I love that you can put on as much or as little salt and butter (or other flavorings!) as you might like. I live in an apartment now and don’t have room for another kitchen contraption, and I’ve found that you can make really good popcorn in a plain old saucepan, with some vigilance. It’s really easy! Microwave popcorn is a nono in my house. Popped on the stove popcorn is the best! Emily, I’m so jealous that you grew up with one of these around! Care to share any of your other favorite flavorings?? I have one of these Whirley Pops and it really works great. Their popcorn is great, too. Raye, so glad to hear it! Do you use their flavored popcorn mixes or just the good ol’ plain stuff? My daughter had to have one of these for Christmas; she had seen one at a friend’s house and was enamored. She left it at my home on Christmas day and that was a mistake because I thought I would try it one day and fell in love. After her relentless begging for the gift I did give her; I finally broke down and bought another one for me. Never again will I eat popcorn saturated in someone’s else idea of oil and or flavorings; this just makes the best popcorn. Easy and quick and maybe a hundred times better than microwave; I’m in love with popcorn again! Hi Barbara, I so agree with you! My son is a popcorn lover and I found a second-hand whirley pop at a garage sale. I thought we would try it once and then return to microwave bags. Nope, never again. I love the idea of being able to season to my taste. What a happy accident, Barbara. It’s so nice to hear that some things still spread by word of mouth – and how fitting that it’s regarding simple, old-timey popcorn! I have friends that just swear by this popcorn pan as the only thing that saves their popcorn. I don’t have one myself, but do see the why it’s popular. The pan shaking to keep popcorn from sticking to the bottom is an art that many can’t seem to master. This machine is really very cleverly designed. It’s really just a jerking/sliding motion across the burner or grate. But you also need to lift the pan off the heat occasionally (a few inches) to listen to the action and release the steam by lifting the lid very briefly. Toward the end, when the popping is down to only a couple pops per second, keep the pan just above the burner while shaking it back and forth. You may have a few “old maids” but it’s worth the sacrifice for the good of the unscorched batch! I love mine too. It’s always sitting on my stove top. Does that tell you how much my family loves popcorn cooked in it? Mine too, Lauralee. I actually have the red model, and I love how bright and cheery it looks sitting out, always ready to pop up the good stuff! My daughter and I both love popcorn. She prefers hot air popped corn with nothing but a little salt. I want the good old fashioned kind I remember from my child, plenty of salt and just the right amount of melted butter. popped on the stove top. I’m so excited to see that I can get one of these lovely Whirley Pops from Amazon, for a very reasonable price,too. This is now at the top of my must have list. Linda – yes! Hopefully this can be a happy medium for you both. Do let us know how it works out for you! Do you have to put butter or oil in to use it? Lin, yes. Just like regular stovetop popping, you add a little oil or butter to coat the bottom of the pot before popping. I love this device. It sees a lot of use in my house. It’s important to use decent oil in my opinion. Ive used the cheap stuff and it didn’t taste good. I also like to use an extra bit of my favorite olive oil in the bottom because it gives the popcorn a nice flavor. Good tip, Ben. I concur! Thanks everyone for the oil info. I think I want to get one! You won’t be sorry, Lin! Love this, just bought it through your link! Thanks! I love my Whirley Pop. I use it to make kettle corn. When the oil is ready, I add the corn kernels and sugar. I keep cranking until the popping stops, dump it into a large bowl, and add salt. Delicious. Janet, that sounds delicious! Would you mind sharing – what is your kernel to sugar ratio?